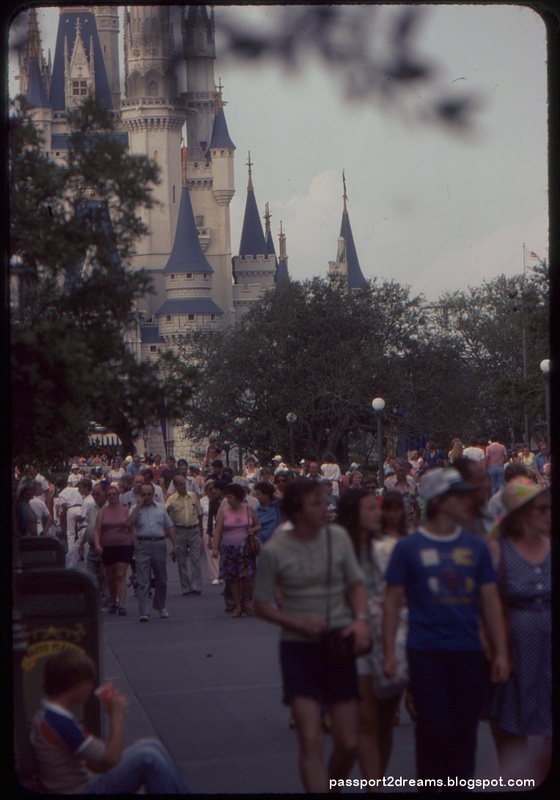 Searching through old Disney photos and slides and home movies is often more disheartening than it is fun. Just as the average tourist often returns today with little to show than some shots of the castle, a flash photo of their group's row in a dark ride, and twenty bad photos of fireworks taken on a smartphone camera, so too were the tourists in the early days of Disney fairly uninspired. 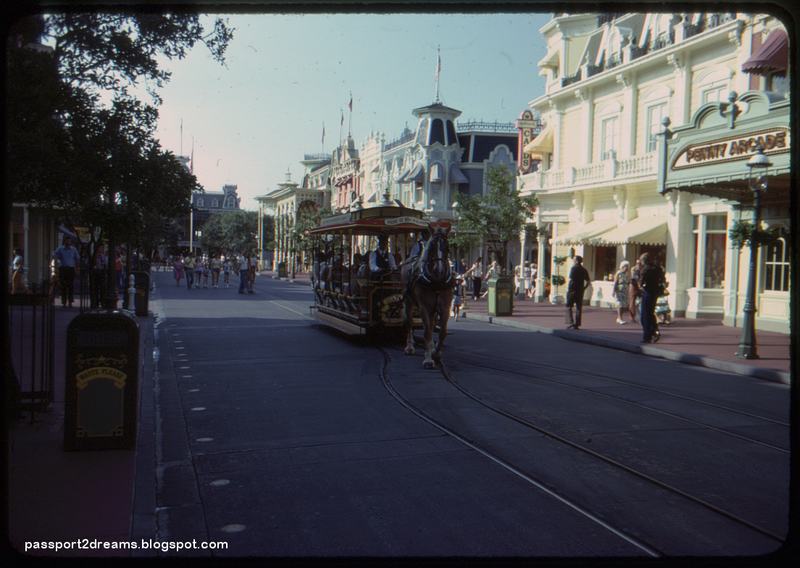 Fathers hampered with the limitations of slow lenses and expensive film often shot only the reliable photos, which often meant a view down Main Street, maybe something on the Jungle Cruise, a monorail, and possibly one of the Magic Kingdom's many bands. You expect to get those; everything else is velvet. 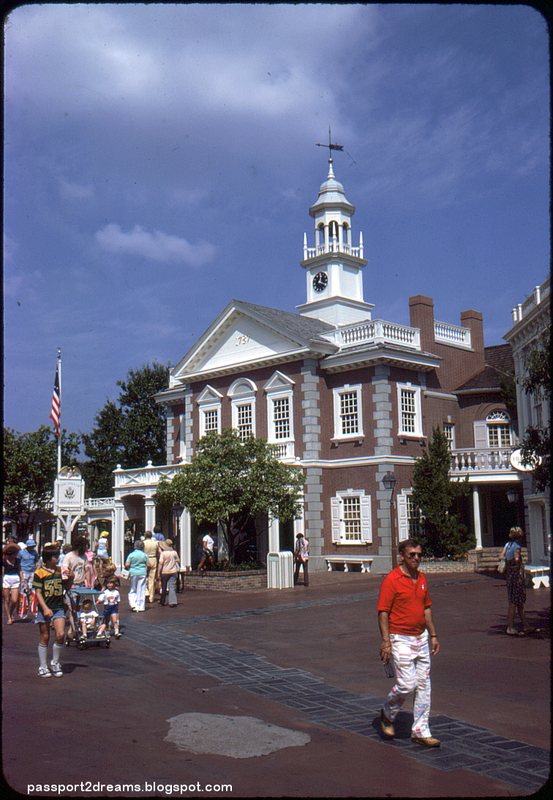 What I have to share today is a rare thing: shots from an ambitious, possibly even professional photographer, with a good camera, in the Magic Kingdom in November of 1978. 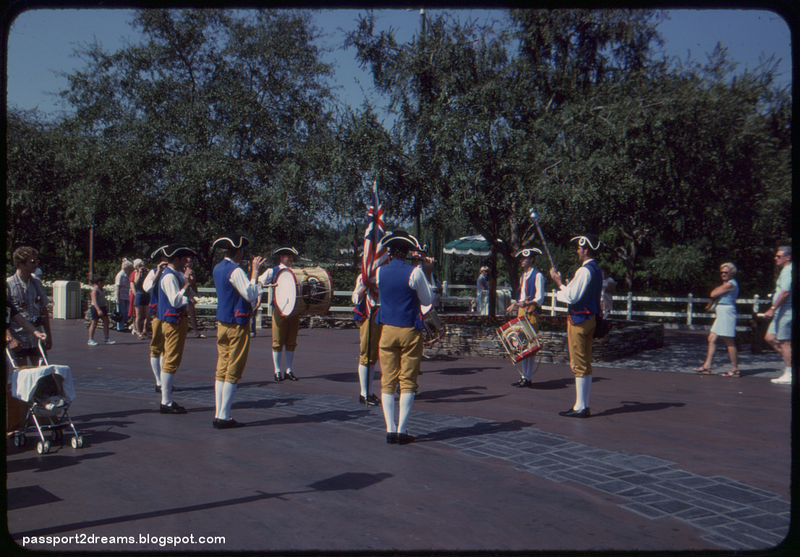 Not every shot is promotional-photo-worthy perfect, but it's rare to simply even see vintage WDW photography of this caliber. Our photographer had a good eye for composition and an interest in architecture, making for much more interesting viewing than your typical vacation snaps. There were too many slides to share everything, but here's a sample of the best and brightest of a remarkable, unusual document. 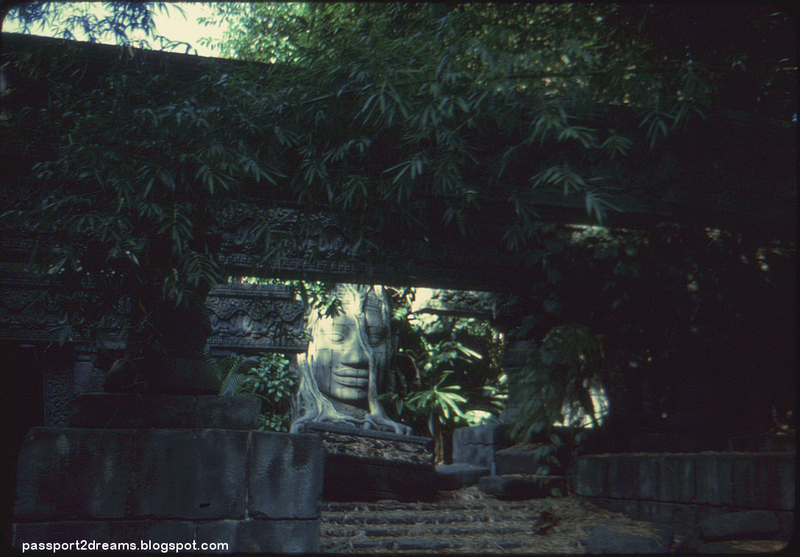 Let's begin with a batch of images from the Jungle Cruise. 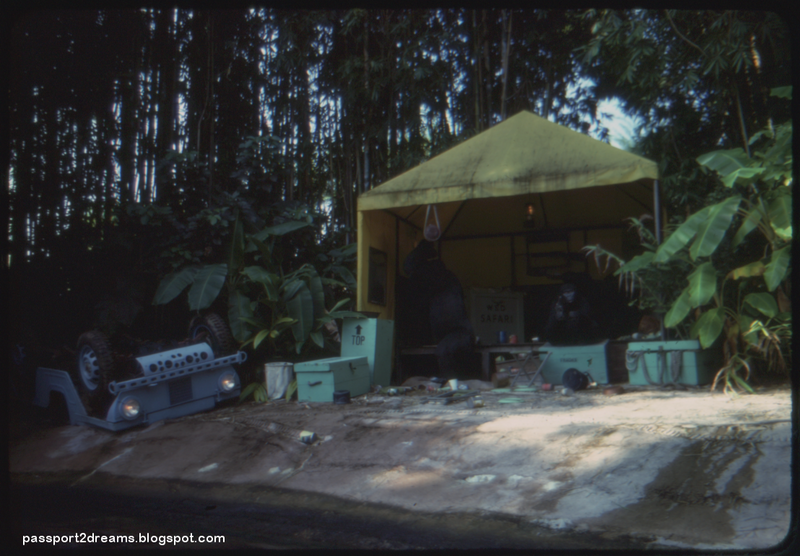 The Gorilla Camp hasn't changed too much in the past 44 years, although there is something to be said for the stark simplicity of the scene's original propping, the simple green crates reflecting an era before the "vintage" theme was applied to the attraction. The mother/baby gorilla figure in the back left of the scene is out for repairs, giving us a clear view of the "WED SAFARI" stencil on the crate. Many of these boxes are still in the scene, now painted to look like vintage wooden crates, and of course the rear box got changed to read "WDI SAFARI". This is much the same as it is today and, hopefully, as it always will be. 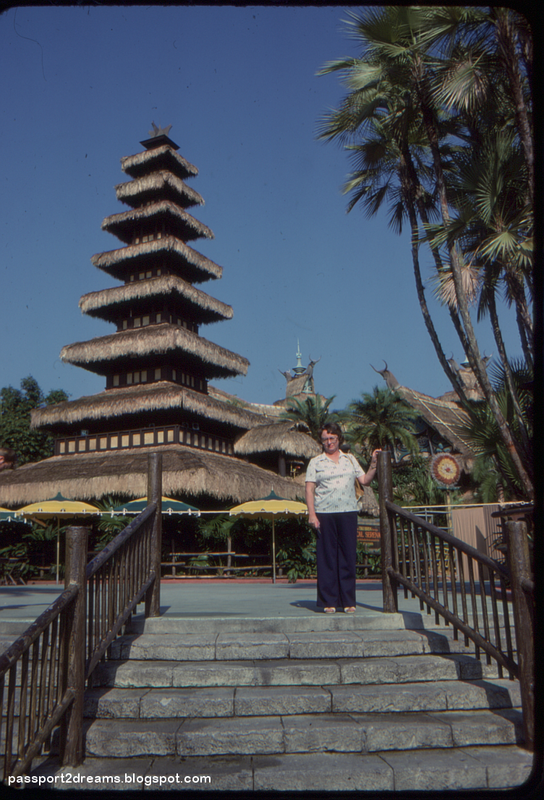 The Sunshine Pavilion with her original authentic thatch - the thatch currently on the building is dye-cute metal. It looked a bit more massive back then before the trees grew to their full height. Note some sort of refurbishment work occuring near the entrance. I'd also like to point out the worn paint on the handrails in the foreground; visible wear and tear is not a phenomenon exclusive to the last 20 years at Walt Disney World. 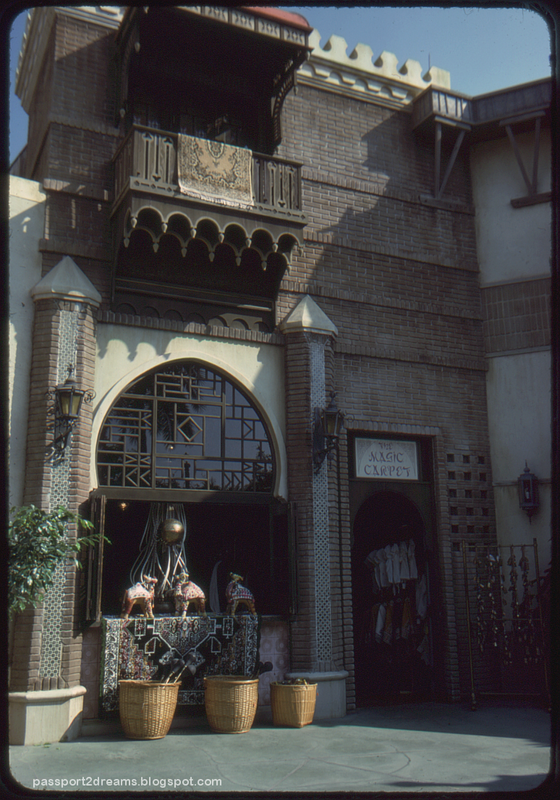 The Magic Carpet in Adventureland was a tiny back alley of a shop offering Middle East goods. This was inside the "inner courtyard" of the circle of shops which made up Tropic Toppers, Traders of Timbuktu, Oriental Imports, and the Tropic Shop. In later years, Oriental Imports, The Magic Carpet, and Tropic Shop would be combined into one long store, called Elephant Tales. This store later closed to become a stock room in the early 2000s when Traders of Timbuktu was removed and the space in front of the shop become Argabah Bazaar. This drop dead gorgeous facade, by the way, is still at Magic Kingdom, but like a lot of things at Disney today it has a giant cartoon tent in front of it. Again, a view almost unchanged today. Notice the giant patch of fill concrete in the foreground - I bet there was once a funny story about that. 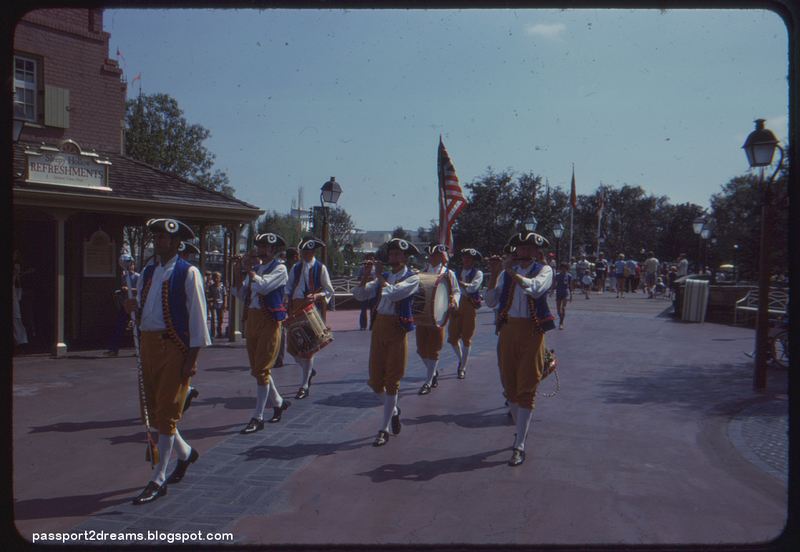 The Ancients fife and drum corp march past the original "walk inside" version of Sleepy Hollow Refreshments, back when its main claim to fame was cold sandwiches and cookies. The Ancients doing their thing in what now seems to be an amazing number of trees. Splash Mountain would dominate the horizon of the top photo today. WDW has re-engineered the planters in this portion of Liberty Square at least three times to relieve guest flow during parades. 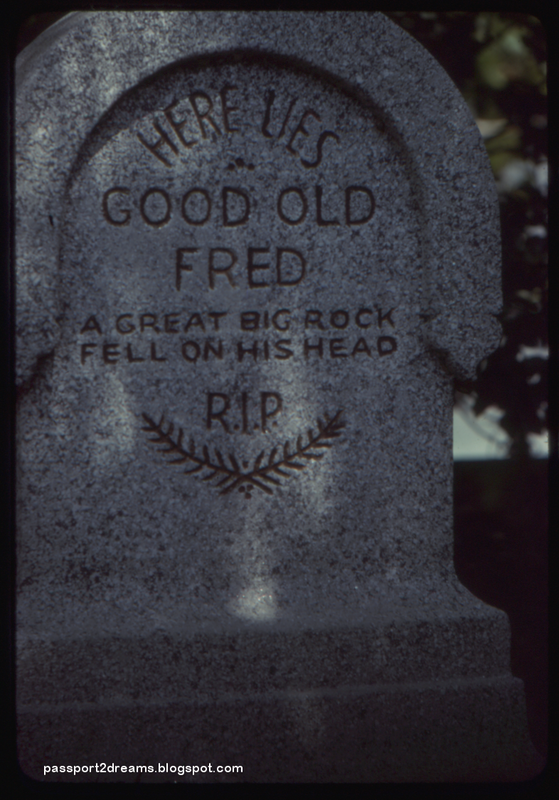 Two especially nice close-ups of graves outside the Haunted Mansion's original family plot. 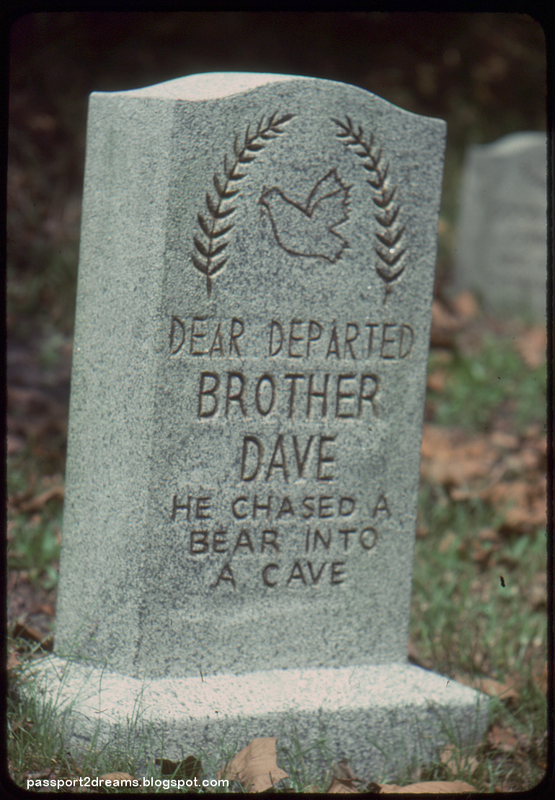 By the time I was going to Walt Disney World, these had been painted in a much more realistic stone wash and subject to enough Florida weather abuse to genuinely shock me, upon working the attraction, that they were actually hollow fiberglass. As you can see, the 1971 originals looked less than convincing. The new set of gravestones outside the house as part of the controversial interactive queue, by the way, are all genuine stone. Our only real view of Fantasyland today, but it's a dilly. In the background we can see how throughly forested the area was before the mass removal of trees in the late 90s. 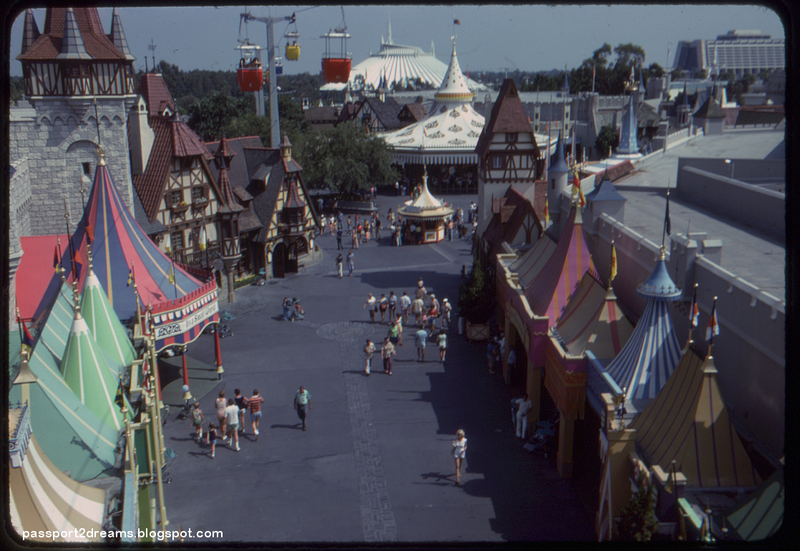 This angle also gives us excellent views of the original, much superior color schemes for the Small World tent facades in the 70s, before everything began to drift pink and purple in the 1980s. Most interesting to me in a clear view of the cobblestone paths that used to zig zag through Fantasyland. The area is a giant sea of red concrete now and the results are unfortunate. A terrific view of the Flower Market, Bicycle Shop, Hallmark Shop, and Chinese Laundry on Center Street. 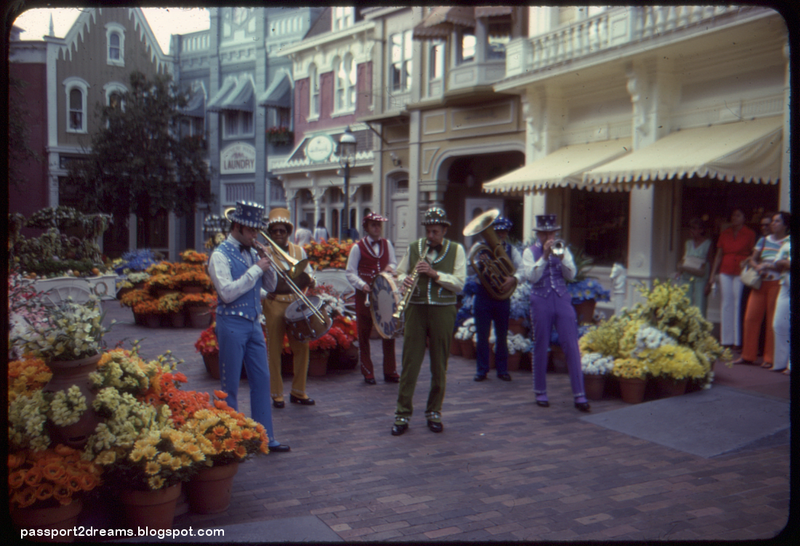 These guys are usually called the "Fantasyland Pearly Band" in company literature, but the unknown photographer here wrote their name on the slide as the "Jambayala Jazz Band". 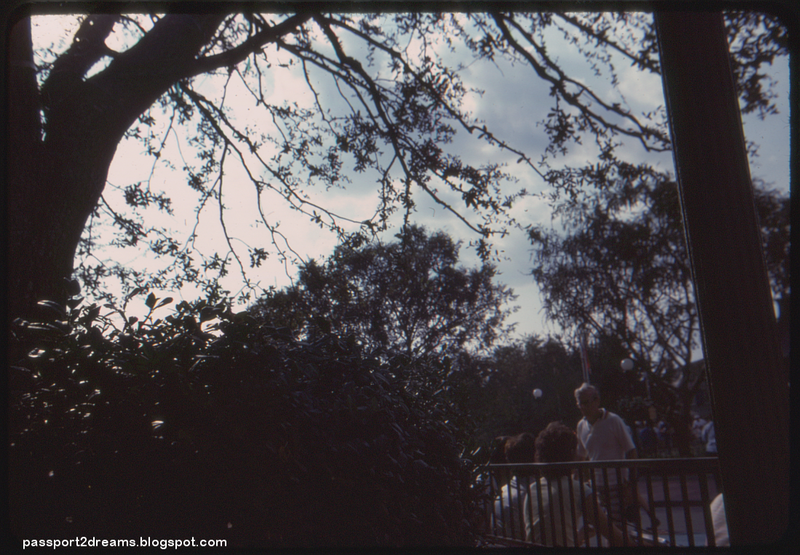 This one is usual: it's a view of the spreading trees of the Hub from inside the planter. I'm not sure exactly what the photographer was going for here, but it's sufficiently unusual enough to share. 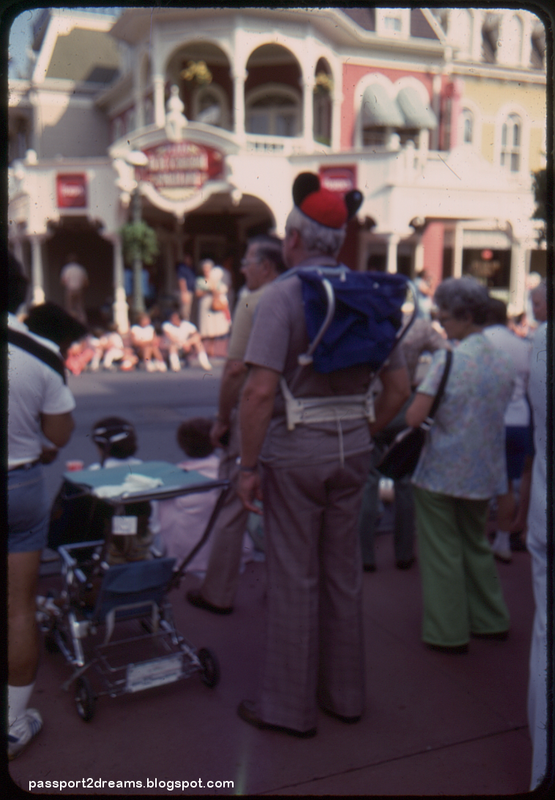 Our photographer took a few candid park guest photos, including one of a young lady in a hijab, and this is the most interesting to me... grandpa standing by his nephew's stroller wearing the "Youth" size Mickey ears. It's both universal and uniquely Disney. ...a gorgeous early evening view looking the other way. This framing strongly recalls early Disney promotional photos, enough to suggest that our photographer saw it on a postcard in the Emporium and rushed out to replicate it. I love the sense of the waning Florida evening light and the unstaged boy in the corner sipping a Coke. Come back next week for a visit to the Walt Disney World Village through the lens of the same photographer! I don't know what the problem is, but several of your photos only load half the image for me. I don't have this problem with other sites. Just wanted to let you know. Thanks. As a frontier land operation cast member from 1977-1981, this brings back a lot of great memories. While it's a "funny story" about the concrete patch in the road, I remember why very well why it was there. 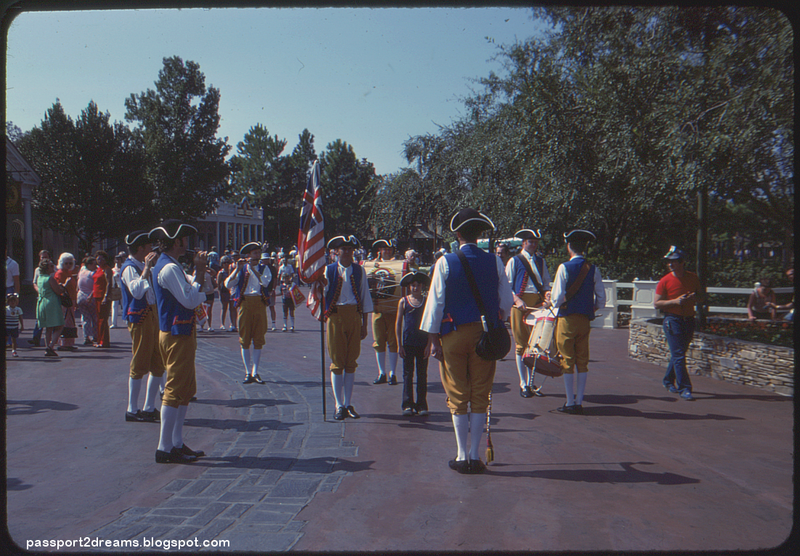 That is where the parade route was through Frontierland, and there was a dip in the pavement there. A few of the parade "floats" when it would drive through that spot and the wheel went over it at just the right spot, the float would drag on the ground where the stone was and make a very loud sound as well as make the float vibrate. They built up the spot there so the floats wouldn't drag the ground there any longer. I remember it well because I was a lead when they put it in and we had to assign someone to stand there to make sure no one walked in it while it was wet even. An unusual day. I think the best photo of the bunch is the only one on which you made no comment. 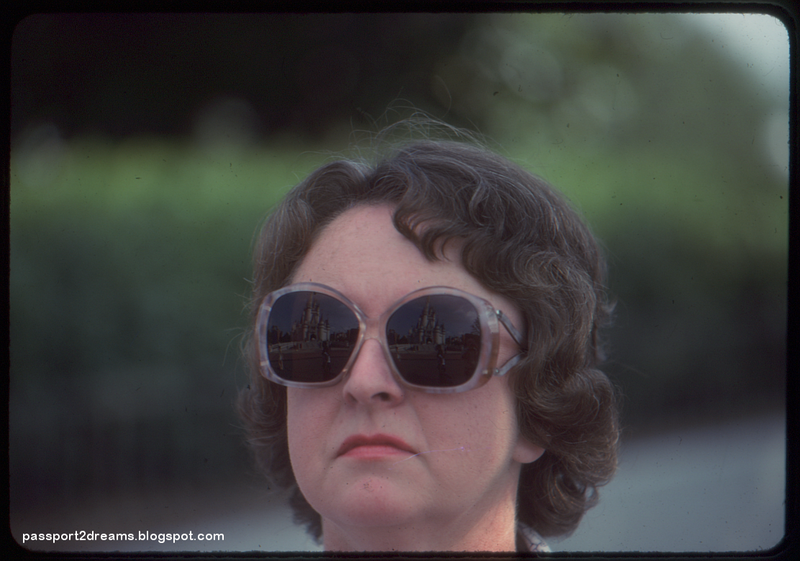 The last one, with the castle reflected in the woman's glasses is fantastic. If I want to send you anything how can I get it to you..? If you're on Twitter my handle there is @MKPony, that's probably the best way.